Taste test: A good, thick and crunchy salt and vinegar chip. 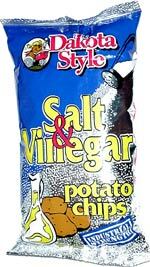 These aren't as oily as some other kettle-style chips we've tasted, which is a good thing. There's also not so much vinegar on the chip that your face cringes when tasting it. A little bit of residue gets left on your fingers, so you may need a napkin. Smell test: Very strong vinegar aroma, don't whiff too hard.